On January 17th the BBC News website published yet another report about Ahed Tamimi – its fourth item in less than a month. Written by Yolande Knell, the article is titled “Ahed Tamimi: Spotlight turns on Palestinian viral slap video teen” and much of its content is recycled from an audio report by Knell that was aired on BBC Radio 4’s ‘Today’ programme the previous week. 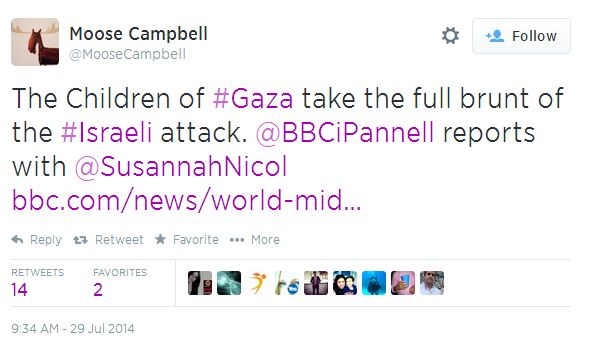 As was the case in that radio report, Knell’s written article does not inform BBC audiences that the video she describes in her opening paragraphs was filmed by Ahed Tamimi’s mother, Nariman, or that the latter has collaborated (along with additional members of the family) with B’tselem’s ‘armed with cameras’ project. Knell does however provide readers with a link (the only one in the article) to Nariman Tamimi’s Facebook account. As was the case in the audio report, she did not bother to inform readers that Tamimi’s then 12 year-old brother was throwing rocks at the time. The four interviewees who appeared in Knell’s audio report – Ahed Tamimi’s lawyer Gabi Lasky, her father Bassem Tamimi, Israeli MK Anat Berko and former IDF chief prosecutor Lt-Col (res) Maurice Hirsch – are also quoted in this written report. As was noted here when the indictment against her was issued at the beginning of the month, in addition to charges of assault and stone-throwing, Ahed Tamimi was also charged with incitement. “Regarding the incitement charge, the MAG [Military Attorney General] cited a statement given by Ahed to her mother, who was filming the December 15 incident on Facebook Live. Immediately following the squabble, Nariman asked her daughter what kind of message she wanted to convey to viewers. “I hope that everyone will take part in the demonstrations as this is the only means to achieve the result,” she said. “Our strength is in our stones, and I hope that the world will unite to liberate Palestine, because [Donald] Trump made his declaration and [the Americans] need to take responsibility for any response that comes from us,” Ahed added, apparently referring to the US president’s decision last month to recognize Jerusalem as Israel’s capital. However, in one of her final paragraphs Knell presents BBC audiences with a very different interpretation of Tamimi’s call for violence. Interestingly, a report in the Jerusalem Post shows that Tamimi’s lawyer Gabi Lasky used a remarkably similar claim in court. “Gaby Lasky, a high-profile human rights lawyer and Meretz activist who is defending Tamimi, told the court Monday that the Palestinian teen mostly was protesting US President Donald Trump’s declaration recognizing Jerusalem as Israel’s capital. And that raises the question (not for the first time) of whether Yolande Knell is a reporter or a political activist who compromises the BBC’s reputation for impartiality. On January 1st the BBC News website published a report titled “Palestinian girl charged after slapping soldier on video“. Parts of that report are recycled from a BBC News website article concerning the arrest of Ahed Tamimi that was published on December 19th 2017. Four links that appeared in that previous report – a Facebook post by her father, an article from the notoriously partisan and inaccurate Al Jazeera quoting her aunt, one Ynet report quoting her father and a second Ynet report relating to a previous incident in which she was involved – are promoted once again. While – in contrast to the previous report – this one does clarify that Ahed Tamimi’s mother Nariman filmed and disseminated the footage of her daughter assaulting an Israeli soldier, the full extent of the Tamimi family’s activities – including the organisation of weekly rioting – is once again not revealed to BBC audiences. She faces 12 charges including aggravated assault and throwing stones. Readers are not informed that – as reported by the Times of Israel – she has also been charged with incitement. “Among the charges against Ahed were aggravated assault of a soldier, threatening a soldier, preventing soldiers from carrying out their duties, incitement, disturbing the public peace and stone throwing. Regarding the incitement charge, the MAG [Military Attorney General] cited a statement given by Ahed to her mother, who was filming the December 15 incident on Facebook Live. Immediately following the squabble, Nariman asked her daughter what kind of message she wanted to convey to viewers. Notably, while the BBC did elect to amplify the Tamimi family’s claim of “legitimate resistance” and to inform its audiences that “many Palestinians have hailed Tamimi as a hero of the resistance to Israeli occupation”, it refrained from telling them of her support for terrorism and advocacy of the murder of Israelis. 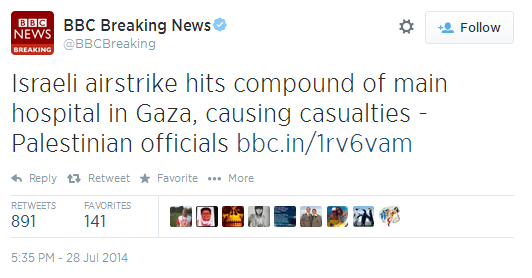 On August 3rd 2014 the BBC told its audiences that Israeli forces had attacked a UN school in Rafah. 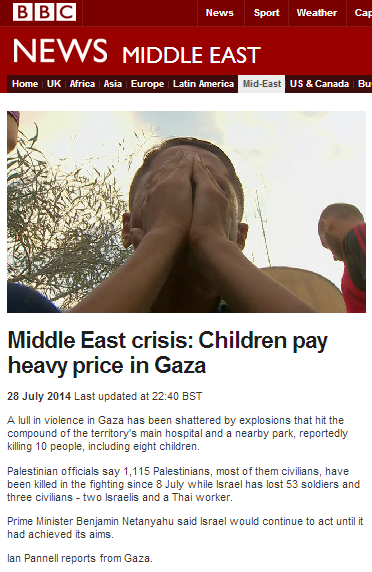 BBC correspondent Martin Patience produced a filmed report titled “Gaza crisis: Chaos after deadly strike ‘at UN school’” in which he informed viewers that Israel was serially attacking UN schools. In an article which appeared on the BBC News website on the same day, quotes from UN officials were given amplification. “Robert Turner, director of operations for the UN Palestinian refugee agency in Gaza, said: “The locations of all of these installations have been passed to the Israeli military multiple times. “In media reports, as well as in the complaints and reports of NGOs and international organizations, it was alleged, that on August 3, 2014, at around 10:45, a number of civilians were killed and others injured, as the result of an IDF aerial strike in proximity to a Rafah school run by UNRWA. The number of fatalities varies from report to report, and ranges from seven to fifteen fatalities. According to the main allegation arising in the aforementioned complaints and reports, the strike took place a few meters from the gate of the school, which was at that time serving as a shelter for civilians who had evacuated their homes, at the exact moment when the gate was open, and was aimed at a motorbike that was passing through the area and its riders. The incident was subsequently referred to the FFA Mechanism for examination. Obviously footnotes need to be added to the relevant reports still available online in order to clarify to members of the public that the claim that the UN school was attacked is inaccurate. 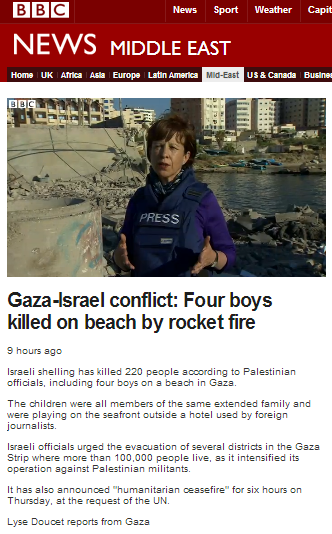 Since the end of the conflict between Israel and terror groups in the Gaza Strip two years ago, investigations into several of the incidents reported by the BBC have shown (see related articles below) that audiences were at the time given inaccurate and misleading information. To the best of our knowledge, none of the specious reports which still remain available online (and form part of what the BBC terms ‘historical record’) have been amended to inform the general public of the outcome of investigations into the incidents and to correct inaccurate and misleading information included in their content. 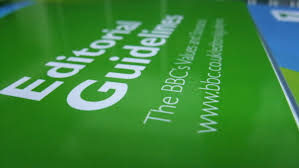 The failure to take such necessary steps risks the waste of publicly funded resources on complaints relating to those reports due to the fact that the BBC’s editorial guidelines state that if content is still available online, it may legitimately be the subject of editorial complaints. As readers know, the BBC’s coverage of the recently released UN HRC report on last summer’s conflict (see here and here) has been superficial and uncritical, doing nothing to inform audiences of the political motivations behind the commission’s formation or of the political agendas of some of the report’s contributors. Despite its unquestioning approach to the report’s contents, one aspect of its findings has been completely ignored by the BBC – even though it has bearing on some of the corporation’s own content still available on the internet. “In another incident, which occurred in the afternoon of 28 July on the first day of the Eid holiday, an explosive hit Swaidi street next to a children’s swing in the Al-Shati refugee camp in northern Gaza. Eleven children, between 5 and 14 years old, and two adults were killed and up to 45 people were injured, some seriously and many of them children. According to witnesses it was the Eid holiday and a temporary ceasefire had been declared so parents were outside in the street celebrating with their children. The street was also more crowded than usual because many people displaced during the conflict had moved to the Al-Shati camp seeking safety. Between 4 and 5 p.m. an explosive landed on the street between a food store and the children’s swing where children were playing. The single explosion spread a large amount of shrapnel across the area. Three eyewitnesses told the commission that the explosion threw children’s bodies around and tore them to pieces. The MAG [Military Attorney General] announced on 7 December 2014 that following a thorough review of the incident by the Fact-Finding Assessments Mechanism (FFAM), “…such a strike by IDF forces could not be identified. However, Israel’s technical systems recorded in real-time the path of a salvo of missiles fired from within the Gaza Strip, seemingly by Hamas or Palestinian Islamic Jihad, which landed in the medical clinics and in the Shati Refugee Camp at the time of the alleged incident…” Hamas publicly denied this allegation and the Chief of Police in Gaza told the commission that the bomb disposal team that went to the Al-Shati playground found that the remnants of the weapons were Israeli. The commission received information from NGO’s who conducted field research and a UN source who collected information indicating that the explosion had been caused by a misfired Palestinian rocket. One of them inspected the site after the attack and concluded that the impact of the explosion on the ground could not have been caused by an Israeli missile or artillery shell; the NGO also indicated that eyewitnesses had reported seeing a rescue team go to the place just after the attack, whose members did not collect the wounded but cleared and collected the remnants of the weapons. In addition, two journalists who spoke to the commission also suggested the attacks had been caused by Palestinian rockets misfiring. One of them said that Hamas members had gone to the site immediately after the events and cleared away the debris. The other said he had been prevented by local authorities from going to the site of the attack. 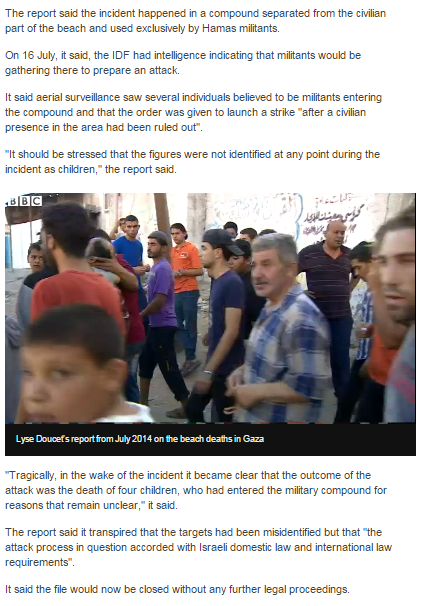 Shortly after that incident occurred we noted here that, despite the information already available, multiple BBC reports portrayed the story in a manner which suggested that the circumstances were not clear and presented the Hamas version of events as a valid option. In August 2014 we noted that the BBC had produced another article in which, despite the information available, the Shati incident was defined as one of several “disputed deadly incidents”. In December 2014 we noted the MAG report on the incident and the fact that all the inaccurate information was still available on the BBC website in its original form. 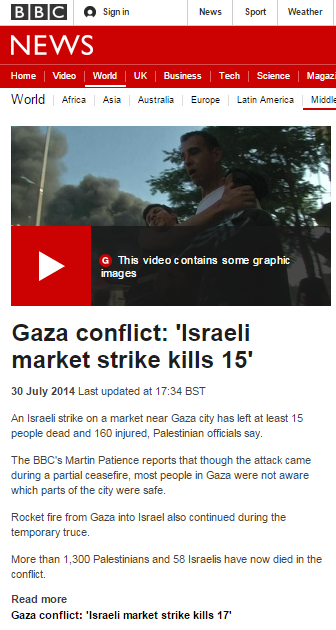 In March 2015 we noted that despite BBC coverage of an Amnesty International report which stated that “an independent munitions expert had concluded that a Palestinian rocket had exploded next to a supermarket in the al-Shati refugee camp in Gaza City on 28 July, killing 13 civilians, 11 of them children aged between seven and 14”, none of the BBC reports from the time had been amended to clarify to audiences the actual circumstances of the incident. 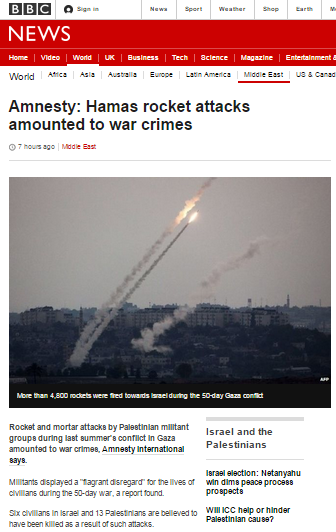 Now, in late June 2015, despite the fact that UN commission has reached conclusions identical to those publicized by MAG and Amnesty International and consistent with the information released by the IDF around an hour after the incident occurred, those inaccurate and misleading BBC reports still stand as they did when they were originally published nearly a year ago. In June 2014 the BBC announced that “however long ago our online content was first published, if it’s still available, editorial complaints may legitimately be made regarding it”. Clearly the prospect of wasting publicly funded resources on dealing with unnecessary complaints concerning those reports has not prompted the corporation to amend them with the required notes of clarification. 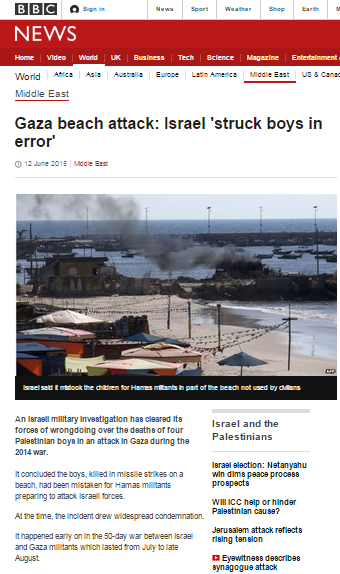 On June 12th the BBC News website’s Middle East page published an article titled “Gaza beach attack: Israel ‘struck boys in error’” relating to the results of the investigation into an incident which took place on July 16th 2014 during Operation Protective Edge (see section 7 here) made public the previous day by Israel’s Military Attorney General (MAG). The BBC’s article describes the investigation’s findings as follows and inserted into the text is a video clip which is a recycled version of Lyse Doucet’s filmed report on the incident dating from July 16th 2014. In that report Doucet described the location of the incident as an installation used by the Hamas Naval Police to “control” local fishermen and cast doubt on the site’s military importance. “An Israeli warplane hit a naval container in Gaza’s port today. Some children ran for cover. Then; a second strike almost immediately. These children didn’t escape. Emergency services rushed the bodies away. Some are so charred they’re too gruesome to show. It’s not clear what the target was at this port. The text of this latest article describes the site as “a compound separated from the civilian part of the beach and used exclusively by Hamas militants”, doing little to provide audiences with the information and context missing from Doucet’s report. However, the MAG findings – which the BBC has obviously read and to which its report links – provide much more detail about the site of the attack. 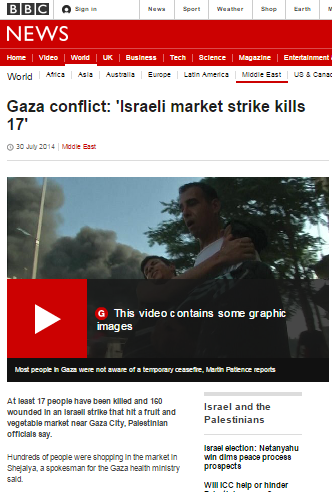 Interestingly, the BBC chose not to convey that information to its audiences. In other words, the BBC not only passed up on the opportunity to correct the misleading impression conveyed to audiences eleven months ago by Lyse Doucet and to clarify that, rather than a police post connected to the fishing industry what was targeted the day before the incident was actually a military supply store, but even re-promoted Doucet’s inaccurate account. In fact, as the MAG report clarifies, the four boys were not “playing football on the beach” but had entered a closed-off compound used by terrorists. No effort is made to balance that statement – made before any investigation into the circumstances of that incident and others had taken place – with professional opinions which, after examination of the evidence, have reached different conclusions than those promoted by Ms Pillay. Unfortunately, even now that the facts are available, the BBC has elected to report them selectively and to unnecessarily amplify Doucet’s previous problematic report once again, thus doing the exact opposite to its public purpose of building “a global understanding of international issues”. 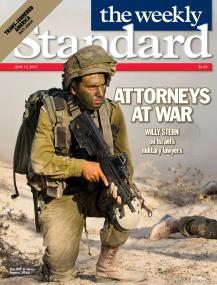 Writing at the Weekly Standard, William Stern provides a fascinating behind the scenes view of the IDF’s legal department. “Buried deep in an old bunker at a Tel Aviv military base is the IDF’s visual operations room. Sit for an hour and you can watch live black-and-white footage of Hamas fighters in Gaza using random kids as human shields while bullets are flying; firing weapons from the second floor of al-Wafa Hospital (used as a command-and-control center as well as a surveillance post); and jumping into a clearly labeled Red Crescent ambulance to escape fire from IDF ground troops.